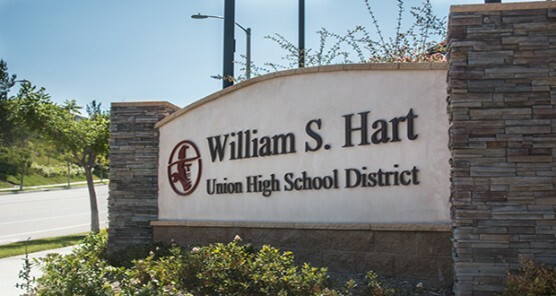 The next regular meeting of the Governing Board of William S. Hart Union High School District will take place Wednesday, March 20, at 7 p.m., preceded by a closed session to start at 6 p.m. This meeting will include two Public Hearings for items IX-C and IX-D regarding initial proposals for negotiations with California School Employees Association Chapter 349. Among other agenda items, the Santa Clarita Valley International charter school will give a report that discusses its math performance since its charter was renewed in 2015. The meeting will take place at the Administrative Center, located at 21380 Centre Pointe Parkway, Santa Clarita. A member of the audience may address the Board on items listed in Closed Session by completing a Speaker Card. Please use the microphone and state your name and location of residence. No action will be taken at this time, and the Board President will limit comment time to 2 (two) minutes. If you wish to speak regarding an item not appearing on the Closed Session agenda, please make your comments during the Public Session (see below). Negotiations with Hart District Teachers Association. Negotiations with California School Employees Association. Ratification requested for Student Expulsion Report No. 18/19-04. Documentation is confidential and maintained in District files. Ratification requested for Student Expulsion Report No. 18/19-11. Documentation is confidential and maintained in District files. Ratification requested for Student Expulsion Report No. 18/19-14. Documentation is confidential and maintained in District files. Ratification requested for Student Expulsion Report No. 18/19-15. Documentation is confidential and maintained in District files. Ratification requested for Student Expulsion Report No. 18/19-16. Documentation is confidential and maintained in District files. Ratification requested for Student Expulsion Report No. 18/19-19. Documentation is confidential and maintained in District files. Minutes of the Regular Meeting of March 6, 2019, presented for approval. Approve the minutes of the Regular Meeting of March 6, 2019. After just five years of competition, the Valencia High School Wrestling program has established itself as a regional power, with several members capturing individual California Interscholastic Federation (CIF) championships this season, and advancing to high placements at the State Championship meet. Four Valencia grapplers took home CIF Division titles this season, and each of them went on to excel at the California State Championship meet. Sophomore Trent Munoz compiled a season record of 39 wins against only four losses. He took first place at five different tournaments on his way to capturing the CIF Northern Division title. Sophomore America Lopez compiled a season record of 29 wins against only four losses, and earned four tournament titles before claiming her second CIF Northern Division title. America was also the CIF Masters Meet champion and finished sixth at the State Championship meet. Senior Priscilla Ramirez compiled a season record of 44 wins and seven losses. She captured five tournament titles before earning her second CIF Northern Division title. Priscilla finished third at the Masters Meet and had a 3-2 record at the State Championship meet. Senior Ben Gould amassed a phenomenal season record of 49 wins against one loss. He garnered seven individual tournament titles before capturing his second Northern Division crown. Ben was also the Masters Meet champion. Ben capped off his senior career with a third place finish at the State Championship meet. The coaches of the Valencia High School Wrestling Team will be present to introduce their student athletes. The coaches are Brian Peterson, Neal Jones, Jeff Pumilio, Doroteo Lopez, Nick Lopez and Jon Soler. Sequoia School Principal Catherine Nicholas will give a presentation on the school’s unique programs that support the safety and wellness of students, staff, and families. If you wish to address the Governing Board on a topic within the subject matter of its jurisdiction, please complete the Request to Address the Board form and return it to the Secretary to the Board prior to the beginning of the item. Comments regarding the Consent Calendar will be taken during Public Comments. Please use the microphone and state your name and location of residence. No action will be taken on any item not appearing on the agenda, and the Board President will limit your comments to 2 (two) minutes. The President may limit public comment time based on the number of persons who wish to speak. If you wish to speak regarding an item that appears on the agenda, you will be called upon to make your comments at the time the item is discussed by the Board. Tracy Glen will give a report on the District’s health services. The Santa Clarita Valley International (SCVi) charter school will give a report that discusses its math performance since its charter was renewed in 2015. In 2015 the William S. Hart Union High School District took action to renew its charter with the Santa Clarita Valley International School (SCVi) for a period of 5 years. At that time, the Hart District Governing Board adopted a conditional charter renewal with the understanding that SCVi must be able to demonstrate continued increases in academic performance, specifically in the area of math. As part of its oversight authority, the Hart District must evaluate the academic achievement of the students at SCVi in comparison to the other students in the Santa Clarita Valley. Moreover, this comparison must take into consideration the specific subgroups of students in order to evaluate whether “all students” are performing “at least equal” to the performance of students in their home districts. With this goal in mind, representatives from the SCVi charter school have been invited to share a presentation with the Board that discusses math performance since its renewal in 2015, and they will share the steps taken to address gaps and to improve academic performance in math. SCVi’s charter is eligible to be considered for renewal in 2020. Adult Education Week is being recognized on March 24-30, 2019. Resolution No. 18/19-29 recognizing the positive influence adult education has on students, parents, and the community is attached. Adopt Resolution No. 18/19-29 recognizing March 24-30, 2019, as Adult Education Week. National Library Week is occurring April 7-13, 2019. Resolution No. 18/19-28 is attached and it addresses the contributions libraries, teacher librarians, and library staff make to students, schools, and community. Adopt Resolution No. 18/19-28, recognizing April 7-13, 2019, as National Library Week. Public hearing and acknowledgment of CSEA Chapter 349’s initial proposal for negotiations with the William S. Hart Union High School District for the 2018/19 school year. On March 6, 2019, the initial bargaining proposal from CSEA Chapter 349 to the William S. Hart Union High School District was presented. The proposal is being presented this evening for public hearing and acknowledgment of receipt by the Governing Board. Acknowledge receipt of CSEA Chapter 349’s bargaining proposal for negotiations with the William S. Hart Union High School District for the 2018/19 school year. Public hearing and adoption of the William S. Hart Union High School District’s initial proposal for negotiations to CSEA Chapter 349 for the 2018/19 school year. On March 6, 2019, the initial bargaining proposal from the William S. Hart Union High School District to CSEA Chapter 349 was presented. The proposal is being presented this evening for public hearing and adoption by the Governing Board. Adopt the bargaining proposal from the William S. Hart Union High School District to CSEA Chapter 349 for the 2018/19 school year. Approval of Fee Amendment No. 3 from Flewelling & Moody for architectural services for the Hart High School Infrastructure Project. During the course of construction of the Phase 2B Infrastructure Project, the contractor encountered unforeseen underground utilities that impacted the footing and masonry walls that enclose the new electrical equipment. In response, the architect and structural engineer must redesign the footings and masonry wall, then submit the revision to the Division of the State Architect for approval. Since this additional work was not accounted for in the architect’s original architectural services proposal, the architect is requesting a fee amendment to cover the additional work. $16,000 plus reimbursable expenses from Measure SA (Fund 21). Approve Fee Amendment No. 3 from Flewelling & Moody for architectural services for the Hart High School Infrastructure Project. Approval of Change Order No. 1 from Castaic HS Construction, Inc., for the Castaic High School Project. Building 700, on the Castaic High School site, was designated to contain career technical education classrooms; however, the specific classroom/laboratory functions had not been determined until recently. In 2016, when the contract for the school was awarded to Castaic HS Construction, Inc., Building 700 was designed as a “shell space” with the understanding that the District would, at a later date, determine details of the program that would ultimately be housed in that building. Last year, the District determined that Building 700 would contain medical, dental and advanced manufacturing classroom and lab space. Ruhnau Clarke Architects, has provided the contractor with plans for the space; however, those plans do not yet have Division of the State Architect (DSA) approval. The contractor is working toward providing the District with the cost to build-out the former shell space. This cost will come to the District and Governing Board as a change order (an increase to the Guaranteed Maximum Price) once the plans have final DSA approval and the contractor can finalize their cost estimate for the work. Until the cost for the building changes can be finalized and agreed to, equipment must be ordered. The dental equipment must be installed as part of the construction and has a lead time of approximately eight weeks. Staff and Lundgren Management recommend purchasing the equipment as soon as possible so that the equipment is available on site once construction work is underway. Approval of change order requests for Saugus High School Auditorium Project Bid Package Nos. 03 (Inland Building Construction Companies, Inc.), 10 (First Responder Fire Protection Corp.), and 14 (LVH Entertainment Systems). Contractor is requesting additional compensation for additional work not included in the bid documents and returning unused allowance for an overall change order in the amount of $42,777. Contractor is returning unused owners allowance in the amount of $10,000 (credit). Contractor is returning unused owners allowance in the amount of $24,633 (credit). TELACU has thoroughly reviewed this request and was successful in negotiating lower costs than originally requested by the contractor. $8,144 from Measure SA (Fund 21). Approve change order requests for Saugus High School Auditorium Project Bid Package Nos. 03 (Inland Building Construction Companies, Inc.), 10 (First Responder Fire Protection Corp.), and 14 (LVH Entertainment Systems). Approval of Change Order Nos. 3 and 4 for the Sierra Vista Junior High School Classroom Addition Project (Bid Package SV1801A-03 – AMG & Associates, Inc.). This change order is to furnish and install the restroom partitions that were supposed to be supplied by Growthpoint Structures. This change order is for incomplete repair work and a 20 year roofing warranty for the roofing that was in Growthpoint Structures’ scope of work. $52,982.94 from Measure SA (Fund 21). Approve Change Order Nos. 3 and 4 for the Sierra Vista Junior High School Classroom Addition Project (Bid Package SV1801A-03 – AMG & Associates, Inc.). Unless a Board Member has a question concerning a particular item and asks that it be withdrawn from the Consent Calendar, the Governing Board approves all the items at one time. Personnel Report No. 18/19-13 regarding certificated, non-certificated, classified and non-classified employees. Approve Personnel Report No. 18/19-13. A textbook has been recommended for adoption for the 2019/20 school year. America Through the Lens: 1877 to the Present (California Edition) – Publisher: Cengage – Author: multiple – Course Area: – U.S. History – Grade: 11 – After reviewing five different publisher’s materials, the high school U.S. History Materials Selection Committee recommends Cengage’s America Through the Lens: 1877 to the Present (California Edition) to be adopted for the upcoming school year. This United States history program aligns with the History-Social Content Standards and the History-Social Science Framework for California Public Schools. Infused throughout the Student Edition and accompanying materials are the ideals of intellectual rigor, accuracy, and respect for American values. By presenting U.S. history as a “story well told,” America Through the Lens: 1877 to the Present (California Edition) draws students into the fascinating and complex narrative of the United States. Components of this program for the student include a print and digital Student Edition, a print and digital History Notebook, and a print and digital workbook titled California Knowledge, Concepts, and Skills. In addition, the complete course is offered on MindTap, National Geographic Learning/Cengage’s online learning portal. MindTap is a personalized learning experience with relevant assignments that guide students to analyze, apply, and improve thinking. MindTap includes not only a digital version of the Student Edition with modified text (where students can click a button to read the texts two levels below grade level); it includes complete audio, video, defined vocabulary works, images, skills sheets, handbooks, maps, and additional special features. Components for the teacher include the print and digital Teacher Edition, and the print California Knowledge, Concepts, and Skills Answer Key, the CA Assessment Handbook, the CA ELA/ELD Connection guide, and the print and digital CA Lesson Plans. Teacher components are also offered on MindTap, the personalized learning experience. Teachers have access to Assessment (online assessment, printable PDFs, writable PDFs, and ExamView), the ability to assign tests and homework, and a gradebook. Funding from State Instructional Materials Funds. Approve textbook, as referenced above, for public review. Authorization to travel to out-of-state events is being requested by staff members at Canyon High, Castaic High, Hart High, Saugus High, and Valencia High Schools. Brendan McCann, a Canyon High School teacher, is requesting authorization to attend the 2019 International Society for Technology in Education (ISTE) conference in Philadelphia, Pennsylvania, June 23-26, 2019. Clarissa Resella, a Castaic High School teacher, is requesting authorization to attend the National Conference on Science Education in St. Louis, Missouri, April 11-14, 2019. Christina Noriega, a Hart High School counselor, is requesting authorization to attend the Advanced Placement Workshop in Fort Worth, Texas, June 24-26, 2019. Mark Kosek, a Saugus High School teacher, is requesting authorization to attend the Project Lead the Way Core Curriculum training in Indianapolis, Indiana, June 16-18, 2019. Robert Zameroski, a Valencia High School teacher, is requesting authorization to attend the Student Television Network (STN) Convention in Seattle, Washington, March 27-30, 2019. Jerry Ostrove, a Valencia High School teacher, is requesting authorization to attend the Cyber Education Discovery Forum in Denver, Colorado, June 24-28, 2019. All expenses for Brendan McCann’s attendance at the 2019 International Society for Technology in Education (ISTE) conference in Philadelphia, Pennsylvania, June 23-26, 2019, will be paid from the 2018/19 Perkins Grant; all expenses for Clarissa Resella to attend the National Conference on Science Education in St. Louis, Missouri, April 11-14, 2019, will be paid from Castaic High School’s School Formula Account; all expenses for Christina Noriega to attend the Advanced Placement Workshop in Fort Worth, Texas, June 24-26, 2019, will be paid from the College Readiness Grant; all expenses for Mark Kosek’s attendance at the Project Lead the Way Core Curriculum training in Indianapolis, Indiana, June 16-18, 2019, will be paid from the Perkins Grant; all expenses for Robert Zameroski’s attendance at the Student Television Network (STN) Convention in Seattle, Washington, March 27-30, 2019, will be paid from Career Technical Education funds; and all expenses for Jerry Ostrove to attend the Cyber Education Discovery Forum in Denver, Colorado, June 24-28, 2019, will be paid from the California Technical Education Incentive Grant. Authorize Brendan McCann’s attendance at the 2019 International Society for Technology in Education (ISTE) conference in Philadelphia, Pennsylvania, June 23-26, 2019; authorize Clarissa Resella to attend the National Conference on Science Education in St. Louis, Missouri, April 11-14, 2019; authorize Christina Noriega to attend the Advanced Placement Workshop in Fort Worth, Texas, June 24-26, 2019; authorize Mark Kosek’s attendance at the Project Lead the Way Core Curriculum training in Indianapolis, Indiana, June 16-18, 2019; authorize Robert Zameroski’s attendance at the Student Television Network (STN) Convention in Seattle, Washington, March 27-30, 2019; and authorize Jerry Ostrove’s attendance at the Cyber Education Discovery Forum in Denver, Colorado, June 24-28, 2019. Approve overnight/out-of-state student trip requests from West Ranch High School (Junior State of America (JSA), Future Business Leaders of America (FBLA)). The submitted trip requests have been reviewed and meet all requirements established by Board Policy and Administrative Regulation 3541.1. The trip requests signed by West Ranch High School Principal Mark Crawford are attached. Approve trips: WRHS JSA, Los Angeles, 4/13-14/19; WRHS FBLA, Sacramento, 4/25-28/19. Michelle Herczog, Coordinator III, History-Social Science at the Los Angeles County Office of Education (LACOE), will provide one day of professional development and materials on April 15, 2019. Bringing a representative from the Los Angeles County Office of Education to the District will increase participation by reducing travel time and overall costs. One day of professional development and materials for 40 history-social studies teachers from all school sites to be provided at the rate of $50.00 per teacher, not to exceed $2,000.00. This is to be paid under the provisions of LCAP goal 2.10 for funding professional development workshops to support Common Core State Standards in all content areas. Approve the contract with the Los Angeles County Office of Education to provide a one-day professional development training on April 15, 2019. State and federal laws require schools to annually review and update their Single Plan for Student Achievement. These site-specific plans describe school improvement activities that are supported with categorical funds. State and federal laws require schools to annually review and update their Single Plan for Student Achievement. These site-specific plans describe school improvement activities that are supported with categorical funds. As required by Senate Bill 374, the school leadership, site council, and advisory committees conducted comprehensive needs assessments as well as an analysis of student achievement data based on the California Dashboard in the fall of 2016 to develop objectives for their action plan. Analysis of the plan reveals necessary updates and revisions. The school site council has approved its revisions, after consulting with school leadership teams and advisory councils, and recommends them to the Board for approval. All legal requirements remain in place for each plan that was approved in May 2017. Annual evaluations conducted at that time meet the requirements of Board Policy 6190. Attached are the revisions for the Golden Valley High School plan for the 2017/18 school year. Goals and action plans remain aligned with LCAP District goals and school goals for increased student achievement. School plans account for the spending of Title I federal grant money allocated to school sites specifically for increasing student achievement at schools with 40 percent socioeconomically disadvantaged families. Allocated costs have not changed. The revisions simply modify the plans guiding how the funds will be spent on each school site. Approve 2017/18 revisions to the Single Plan for School Achievement for Golden Valley High School. State and federal laws require schools to annually review and update their Single Plan for Student Achievement. These site-specific plans describe school improvement activities that are supported with categorical funds. As required by Senate Bill 374, the school leadership, site councils, and advisory committees conducted comprehensive needs assessments as well as an analysis of student achievement data based on the California Dashboard in the fall of 2017 to develop objectives for their action plan. Analysis of each plan reveals necessary updates and revisions. Each school site council has approved its revisions, after consulting with school leadership teams and advisory councils, and recommends them to the Board for approval. All legal requirements remain in place for each plan that was approved in May 2018. Annual evaluations conducted at that time meet the requirements of Board Policy 6190. Attached are the revisions for the school plans of Golden Valley High School and Placerita Junior High School for the 2018/19 school year. Goals and action plans remain aligned with LCAP District goals and school goals for increased student achievement. School Plans account for the spending of Title I federal grant money allocated to school sites specifically for increasing student achievement at schools with 40 percent socioeconomically disadvantaged families. Allocated costs have not changed. The revisions simply modify the plan guiding how the funds will be spent on the school site. Approve 2018/19 revisions to the Single Plan for School Achievement for Golden Valley High School and Placerita Junior High School. Ratify February 2019 Purchase Order Report. Staff requests the Governing Board ratify the attached Purchase Order Report, which covers purchases, as specified, for the period February 1, 2019 through February 28, 2019. This report may contain open purchase orders with not-to-exceed amounts facilitating regular small purchases from single vendors. Open purchase orders with not-to-exceed amounts facilitating larger purchases from single vendors may indicate a publicly bid contract number and/or the date the Governing Board approved the vendor. In an effort to efficiently process payments, the accumulated total of these purchases may be processed and paid as a single transaction. Attached report shows amounts and funding sources for purchase orders processed in February 2019, as well as purchase orders greater than or equal to $50,000. Ratify Purchase Order Report for the period of February 1, 2019, through February 28, 2019. Approve and ratify Warrant Register and Revolving Cash payments. Approve and ratify the above listed Warrant Register issued between February 1, 2019, through February 28, 2019, and order the items filed for audit. Approve Amendment to Lease Agreement between Volunteers of America of Los Angeles and Governing Board of William S. Hart Union High School District. In November 2006 the William S. Hart Union High School District and Volunteers of America of Los Angeles entered into a lease agreement for property at 24823 Walnut Street, Newhall, California 91321. Article I. 1.1 amends Section 2 “Term”. The new lease terms include provisions for a one year lease with the option for four (4) renewals. The total term of the lease is now five (5) years. Article I. 1.2 amends Section 3 “Rent”. The amended language includes a market-based rent rate for the area and inclusion of an annual increase to the rent based on the Consumer Price Index West B/C schedule. $9,600 increase in District revenue per year. Approve amendment to Lease Agreement By and Between Volunteers of America of Los Angeles and Governing Board of William S. Hart Union High School District for the period of July 1, 2019, through June 30, 2020, with option for automatic renewals for four successive one-year terms, unless written notice is provided by either party ninety days prior to the end of each successive term. Approve Amendment No. 1 to the Property and Casualty Claims Administration Services Agreement with Keenan & Associates for the period of July 1, 2019 – June 30, 2020. The District currently has an agreement with Keenan & Associates to provide property and casualty claims administration services, including such activities as investigation, defense, and coverage counsel. Amendment No. 1 amends Exhibit B regarding compensation for July 1, 2019, through June 30, 2020. For each annual period thereafter, proposed fees shall be mutually agreed upon. No changes to rate structure. Approve Amendment No. 1 to Exhibit B Compensation of the Property and Casualty Claims Administration Services Agreement with Keenan & Associates dated July 1, 2018. Approval of Amendment One from Apex Learning Inc. for digital curriculum solutions through June 30, 2022. Staff recommends the Governing Board approve Amendment One from Apex Learning for digital curriculum solutions for the 2019/20, 2020/21, and 2021/22 school years. The District has used the Apex online curriculum to support primarily the Learning Post, Hart @ Home, and Sequoia educational programs. The agreement provides 350 unlimited enrollment subscriptions to comprehensive courses for the period of June 17, 2019, through June 16, 2022, and 100 unlimited enrollment subscriptions during each of the 10-week summer school sessions for the period of June 3, 2019, through August 6, 2021. The cost of this agreement is $54,000 in 2019/20 fiscal year, $54,000 in 2020/21 fiscal year, and $54,000 in 2021/22 fiscal year, for a total of $162,000 to be paid from General Fund. Approve Amendment One to the agreement with Apex Learning Inc. for digital curriculum solutions through June 30, 2022. Ratify agreement with ArbiterPay Services to provide payment services to game officials. Arbitersports.com is used by the William S. Hart Union High School District’s comprehensive high schools to schedule game officials in cooperation with California Interscholastic Federation (CIF) and officiating organizations. Arbiterpay.com is an additional feature that will streamline the payment process for game officials and schools. Last minute changes to game official assignments will no longer require the canceling of pre-printed checks from the Associated Student Body (ASB). Activity Directors and ASB accountants will have an additional check and balance on payments directly tied to game official assignments, thereby improving the audit trail. District internal audit staff will have access to real-time information regarding payments made to game officials. 1099 preparation for game officials will be streamlined and more accurate as they will now be prepared by Arbitersport.com versus the District. No fiscal impact to the General Fund. Fees are absorbed by teams and ASBs. Ratify agreement with ArbiterPay Services. Board Policy 3311(a) provides that the District may piggyback with the contract of another public agency or corporation when the Board has determined it in the District’s best interest. The term “piggyback” is associated with Public Contract Code Section 20118, which allows public entities to acquire property by participating in an existing contract of another public entity. Piggybacking with another public entity contract allows the District to take advantage of lower costs realized through economies-of-scale and also avoids the time and expense of a public bid process. Each piggyback contract is evaluated for participation and usage. When the District’s need is greater than the piggyback contract participation or uasge, the District will author and publish its own bid to obtain best cost. Administrative Regulation 3311(a) further defines that when bids are not required, District staff shall make a good faith effort to secure quotes. Interlocal Purchasing System (TIPS) – Contract 180803 for sporting goods and equipment. Approve the procurement of various items via California-approved piggyback contracts for the 2018/19 fiscal year pursuant to Public Contract Code Section 20118 and Board Policy 3311(a). Pursuant to California Education Code Section 17545(b), the value of the following equipment will be sold through public auction, and if not sold, disposed of as surplus/obsolete equipment pursuant to Education Code Section 17545 (b). Pursuant to California Education Code Section 17546(c), staff requests the Governing Board, by unanimous vote of those members present, find that the property listed below is of insufficient value to defray the costs of arranging a sale and thereby authorize the property to be donated to a charitable organization deemed appropriate by the Board, or disposed of in the local dump. All e-waste will be collected and certified to its proper disposal by an e-waste recycler. Authorize staff to dispose of specified equipment pursuant to California Education Code Sections 17545(b) and 17546(c). Ratify general contractors and subcontractors prequalified in January 2019 application process to bid on certain District public works projects pursuant to Public Contract Code Section 20111.6. Pursuant to Public Contract Code Section 20111.6 (as enacted by Assembly Bills 1565 and 1581), general contractors and mechanical, electrical, and plumbing subcontractors (as defined) planning to bid on certain public projects must be prequalified prior to submitting bids for such projects. Specifically, the District must prequalify bidders on all public projects with an expenditure of one million dollars ($1,000,000) or more, and using funds received under the Leroy F. Greene School Facilities Act of 1998 or any funds from a future state school bond. The District currently accepts prequalification applications on a quarterly basis, and recently issued a notice inviting prequalification (RFQ16-07A) for the January application period (January 7, 2019, to January 16, 2019). The attached list reflects the addition of the first round of contractors approved during the January 2019 application window. Ratify the attached list to include general contractors and subcontractors prequalified in the January 2019 application process to bid on certain District public works projects pursuant to Public Contract Code Section 20111.6. Approval of Change Order No. 1 for the Valencia High School Security Fencing Project (Bid Package VACP1801A – California Fencing, Inc.). On November 7, 2018, the Governing Board awarded the Valencia High School Security Fencing Project to California Fencing, Inc. Due to unforeseen subsurface conditions, the contractor needed to re-dispatch the fence post coring company to drill new fence post holes along the existing planter. Contractor is requesting compensation for this work because it was not indicated on the bid documents. $1,300 from Community Facilities District Funds. Approve Change Order No. 1 for the Valencia High School Security Fencing Project (Bid Package VACP1801A – California Fencing, Inc.). Accept Notice of Completion for Bid Package No. HA17-03D for the Hart High School Infrastructure Project Phase 1 (Stay Green, Inc.). Accept Notice of Completion for Bid Package No. HA17-03D for the Hart High School Infrastructure Project Phase 1 and authorize retention release to Stay Green, Inc. Accept Notices of Completion for Bid Package Nos. SA16-03-01, SA16-03-02, SA16-03-03, SA16-03-04, SA16-03-05, SA16-03-08, SA16-03-09, SA16-03-10, SA16-03-11, SA16-03-14, and SA16-03-15 for the Saugus High School Auditorium Project. Accept Notices of Completion for Bid Package Nos. SA16-03-01, SA16-03-02, SA16-03-03, SA16-03-04, SA16-03-05, SA16-03-08, SA16-03-09, SA16-03-10, SA16-03-11, SA16-03-14, and SA16-03-15 for the Saugus High School Auditorium Project and authorize retention release. Accept Notice of Completion for Bid Package No. VACP1810A for the Valencia High School Security Fencing Project (California Fencing, Inc.). Accept Notice of Completion for Bid Package No. VACP1810A for the Valencia High School Security Fencing Project and authorize retention release to California Fencing, Inc. This Closed Session will be used as an extension of item II – First Closed Session, if needed. In compliance with the Americans with Disabilities Act, if you need special assistance to participate in this meeting, please contact the Superintendent’s Office (661.259.0033.x201). Notification 48 hours prior to the meeting will enable the District to make reasonable arrangements to ensure accessibility to this meeting.